Ready for Battle for Azeroth! By default, DCS displays a character's "Relevant Stats" according to their specialization but hides those stats that are at zero. Bolded stats listed below are displayed by default for all classes and specializations. 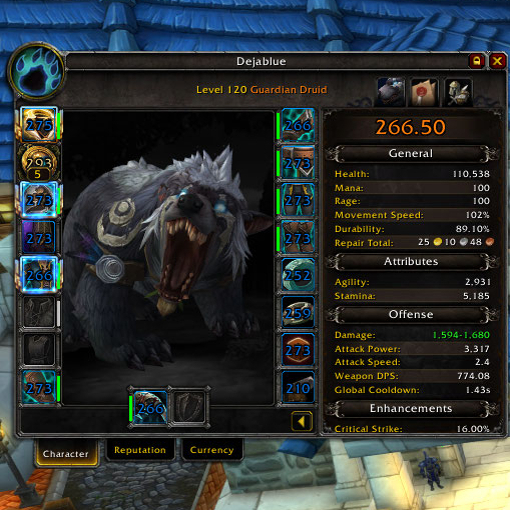 When used with ElvUI v10.82 or earlier with Character skin enabled, unchecked stat categories might appear on the background. A solution has been injected into ElvUI v10.83. If you experience issues with v10.83 then please re-install ElvUI in order to pick up the changes. Recent ElvUI versions might interfere with average item level display. A workaround is unchecking checkbox Display Character Info in General tab. Found error or bug? Reporting them here after following these steps makes the fixing of errors faster. I think there are plenty of socket pictures on Internet; there's no need to beg for them. Absolutely love the April Fools joke. I don't think I've seen an addon pull one before. Very creative, very unexpected. Got me so excited for Classic, and very nostalgic for the removed ranged weapon/relic slot and resistances (and also lol @ how vanilla wands dealt more damage than a 370 wand does today). Hey! Amazing april fools joke feature with the classic wow look on the character armory! Totally digging it. Do you think we can expect to get that as some sort of seperate addon feature for deja, for the people that want to keep it that way? I recently updated the add-on, can't remember when but It was within this week. My option to show Items with higher level thingie, I can't see It anymore, It's kind of hard to describe, It's the Equipped/Available setting. I do have It enabled but It's not working out for me, Is this a bug or something I'm doing wrong? In reply to VeraDoesToons: I just checked and it is working as intended. I believe you are thinking of a different addon. Outside of that, more information is needed such as what gear you are equipping, and or do not have equipped. There's a saying that a picture is worth a thousand words. Providing a screenshot of suspected bug would help to investigate it. I know, It's kind of hard to explain, here. Here's how It looked after the update, It's basically the first one but It doesn't let me know that I have another Item that can boost the level. There's a possibility of addon conflict, corrupted installation or corrupted saved variables. But let's begin by unequipping some items and checking whether info about equipped/available ilvl appears. Should have mentioned before that that was the first thing I tried, mb. Displaying only equipped item level is quite peculiar. As the next step, let's verify whether it's due to addon conflict. Try to disable other addons and write your findings. I am actually also having this problem and have been trying to solve it for ages now. I tried disabling all addons except that and yet it still only displayed my equipped item level rather than both equipped and average. In reply to this, I tried uninstalling all and reinstalling it first and it worked, but as soon as I installed my elvui back it began to conflict preventing it from displaying both which I find quite strange as they are meant to work hand in hand together. Any thoughts? And again, here is just some screenshot proof to show the difference with and without elvui.